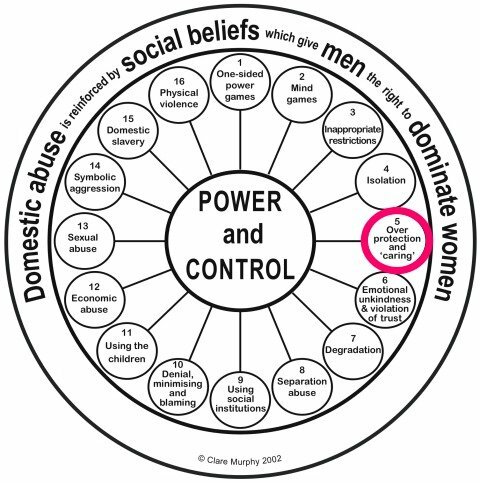 This is the fifth of 16 blogs discussing the patterns of tactics from my power and control wheel – Over-protection and ‘caring’. These kinds of beliefs lead to behaving in over-protective ways in the guise of caring. This includes begging the woman not to go out alone or she might get raped, telling her she never has to work (even though she wants to) because he wants to take care of her, taking her to and from work so her co-workers will not get ‘ideas’, or attempting to keep her at home by saying he worries when she’s away. When men operate from possessive jealousy, many women perceive this to be a sign of love and commitment – especially during the dating and early phases of the relationship. However this is a notion learned from places such as fairytales, romance novels and movies – it is absolutely not true. Jealousy is about the jealous person’s own beliefs. At the personal level, a jealous man’s feelings stem from beliefs about himself such as believing he’s inadequate, unworthy, or not good enough. At the social level a jealous man’s feelings stem from the belief that as a boyfriend or a husband they own their female partner. Belief that marriage implies men’s ownership of female partners can be traced back to ancient Greek and Roman times. Manuscripts dated during the medieval period (900-1300) state that the Church, for instance, pushed for the idea that women should obey their husbands, and men were granted the authority to castigate their wives and beat and otherwise control her to correct her behaviour. Whilst men’s sense of ownership of their wives has been played out for centuries, not everyone has always agreed with this form of relationship, and for the past 50 years there have been consistent major challenges – by men and especially by women – to dismantle such inhumane forms of relationship. The problem is that gender socialisation in western societies continues to be steeped in subtle (and sometimes very obvious) social support for men’s ongoing ownership, control and enslavement of intimate female partners. Men’s possessive sexual jealousy is used to justify isolating women from social opportunities, as well as for monitoring women’s whereabouts and as an excuse for stalking women. Possessive sexual jealousy is often at play when a controlling man kills his wife or his ex-wife and and sometimes her new boyfriend. Believing in Knight in Shining Armour stories can lead to confusion for some women when their partner tries to stop her from leaving the house for fear she will be harmed. Early in a relationship this can sound charming and be thought of as a sentiment that means he loves her. It is often only after months or years of an ongoing pattern of feeling controlled and restricted that some seemingly innocent behaviours start to become of major concern. It is important for women to trust their perceptions about their partner’s motivations. When women are continually being blamed for making their partner jealous – yet are not actually doing anything that is dishonest or untrustworthy – it is important that the woman not doubt herself – that she does what it takes to maintain a belief in her own integrity. Many men’s possessive and jealous behaviours are motivated by beliefs that they have to stay on top, otherwise they believe they will fall prey to condemnation from others (often other men), many believe that they are a failure as a man if they do not appear to be ‘wearing the pants’. Some men have experienced bullying by other men aimed at shaping this kind of masculinity, so to avoid victimisation they do what it takes to show their masculine prowess for the sake of being accepted by other men. And if there are no other men to prove this to, some men have learned that controlling women and treating them as possessions is a way to feel they have succeeded. But many men want a caring relationship. But a relationship is about team work – doing what it takes so that all team members can flourish. When one team member (in this case the man) plays by a set of rules that controls and restricts the other team member so that the man comes out the winner – that’s not only destructive for the woman – but it is also destroying the man’s sense of wellbeing and happiness. It is also destructive for any children growing up in this atmosphere. Sam, one of the men I interviewed, said that challenging peers to stop controlling, abusing and using women “does cross your mind” but what “does play on your mind more is that my mate can’t see that soft side.” And here’s the paradox – ‘real men’ are supposed to have courage and strength – yet many don’t use that courage and inner strength to stand up against social pressures to control the women they love – because doing so has been labelled “soft” and that’s not manly. Dating a man with jealousy and control issues is a very dangerous situation. I did date one for a couple years. He started off pretending to be someone else, caring, normal, nice, all the things they learn to do to catch a girl. Then they switch into pure scary evil mess. I can’t stress enough how bad it gets when you’re in this kind of relationship. I was tormented if I didn’t do what he deemed necessary to make him happy. He demanded that I wear boys t-shirts, tried to isolate me from family and friends. He constantly called me and tried to get me to marry him within six months of knowing him. They have to move fast so you can’t figure out what they are really doing. Once you’re stuck you’re in for hell on earth. I eventually realized that he was a pig wearing sheep’s clothing and got out of it. Brutus was the scariest dude I ever dated and I know I was lucky enough not to move in with him. These guys are true predators and take your soul and eat you for breakfast. They are mentally unhealthy in every way possible.